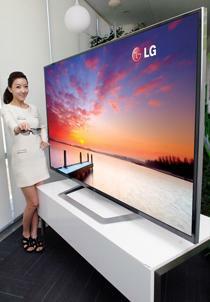 It boasts four times the resolution of 1080p, it's 3D capable, and it's gigantic. Take a look at your TV. If you're not in your living room or you're at work, just imagine it. You've probably got a set somewhere between 40" and 60" right? Now imagine what an 84" set would look like in your room. If it was just the size alone, LG's creation would still be worth talking about. There's more to it than that though. This monster TV is capable of Ultra Definition - a pixel count of 3840x2160. It's LED backlit and also packs 3D video improvement features like depth control, and 3D Sound Zooming for better 3D audio immersion. If that's not enough, the set also has connected TV features and can use any of the apps on LG's Smart TV ecosystem. There's no launch date or price yet, but we're betting it's going to cost a pretty penny.